Since the day I started encountering Google issues with my HealthnBeyond.com blog early this year, I began searching for alternatives on how to continue my passion in blogging about health and medicine (as I am a pharmacist). I never wanted to end my HealthnBeyond.com blog as it had been established already - the friends who support me and the blog (through my blogroll - link exchanges), the followers through google connect, the technorati rating and more. However, I had to . HealthnBeyond.com continuously receives advertiser invitations to write for their companies and products and I am really thankful and flattered about that. Problem is, the blog (HealthnBeyond.com) is no longer cached and indexed by Google. I have done everything to fix the problem - contacted Google and followed every instruction they gave me, updated my sitemap more than a dozen times and yet, the blog still encountered sitemap errors. Due to the "no longer cached and indexed" issues, I have come to a decision to no longer renew the domain (due to be renewed on August 13) and therefore, closing it. I have also stopped accepting advertised posts since I feel it's too unfair for the advertisers to pay me if the articles they've paid for can no longer be indexed in Google pages. 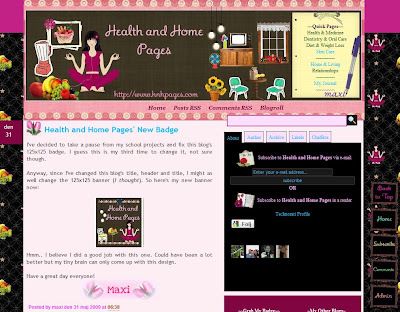 A month ago, the creation of Health and Home Pages has begun. I have thought deeply of the concept, the title, the domain name, the layout and the necessary badges. It has been running for weeks now but only a few of you know about it yet. Today, I am launching my new blog and I hope that you will also welcome it warmly the way you have welcomed my HealthnBeyond.com and this blog (Ovah' Coffee). I will be very happy if you add my new blog to your blogrolls... and as always, I will be honoured to return the favor and add you up in my blog list. Have a happy Monday everyone! Hugs! I understand, and it's frustrating to do things over and over only to get the results you don't want every time. We still get to see the Blugging Queen on here and her Health & Home Pages which is the good news. Well, maybe not for me because you'll still continue your reputation as the undisputed queen of blugging friends! LOL! Hehehe. Anyway, I'm going to be flying to California shortly, and won't be online as much until after I get back. I maybe meeting one of the most popular and kind bloggers we both know while there! wow! really 'd? i wish i can say that, too "i will be flying to california shortly". hihi. that would be awesome! well well.. as of now, i can only say, "i will be flying to the philippines on july 1" that's great, too as i get to visit my family. oh yeah. blugging queen ha... with loooong comments. wonder how many people are already irritated of me. hope not so many though. i got really frustrated. to think i even purchased a sitemapper just to fix things and still, it wasn't successful. but at least, i've tried to save the blog. gosh gosh. That is so sad, I really feel for you, I nearly lost my blog some weeks ago and that was terrible enough, but then I am sure you will do well with the new blog, will link you for sure, will visit for the first time when I have sent this comment. I wish you all the of the best and hope your new blog will do as well if not better than the lost one. thanks colin. i really never wanted to "surrender" my other blog as i really love it a lot. tried to save it as much as possible but can't.